Made fresh daily, La Sem provides a wide selection of European style pastries including fruit tarts, sfogliatelle, cream puffs, éclairs, napoleons, petits fours and our renowned La Sem cannoli. We still make our own fresh cannoli shells and you can taste the difference quality makes. 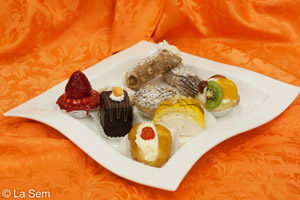 Award winning best cannoli in the GTA by the Toronto Star.